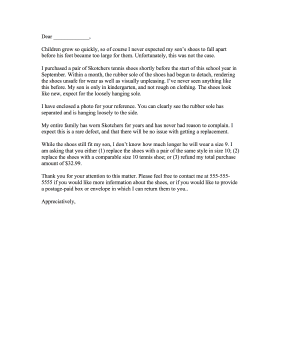 The defective product in this retail complaint letter is a pair of shoes. Children grow so quickly, so of course I never expected my son's shoes to fall apart before his feet became too large for them. Unfortunately, this was not the case. I purchased a pair of Skotchers tennis shoes shortly before the start of this school year in September. Within a month, the rubber sole of the shoes had begun to detach, rendering the shoes unsafe for wear as well as visually unpleasing. I've never seen anything like this before. My son is only in kindergarten, and not rough on clothing. The shoes look like new, expect for the loosely hanging sole. I have enclosed a photo for your reference. You can clearly see the rubber sole has separated and is hanging loosely to the side. My entire family has worn Skotchers for years and has never had reason to complain. I expect this is a rare defect, and that there will be no issue with getting a replacement. While the shoes still fit my son, I don't know how much longer he will wear a size 9. I am asking that you either (1) replace the shoes with a pair of the same style in size 10; (2) replace the shoes with a comparable size 10 tennis shoe; or (3) refund my total purchase amount of $32.99. Thank you for your attention to this matter. Please feel free to contact me at 555-555-5555 if you would like more information about the shoes, or if you would like to provide a postage-paid box or envelope in which I can return them to you..